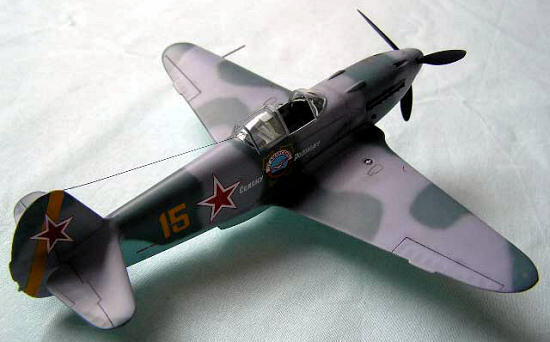 Yak-3 “Yellow 15”, Semyon Rogovoy, 1st. Guards Air Division, Amur River, Soviet Far East, 1945. The concept of the “light fighter” (a machine which owes its good power/weight ratio to a light airframe and not to a powerful engine) was extremely popular among designers in the thirties. Most of this kind of machines (Koolhoven FK.58, Caudron Renault C.714, Fokker D.XXI) can be regarded as failures or near failures, while others (like the Bf 109) owed their success to the ability of putting up weight (armour, armament, fuel) and accepting more powerful engines. Though not strictly “light fighters”, most early Japanese designs also displayed that typical inability to provide enough protection to the pilot and fuel system so characteristic in this type of machines. 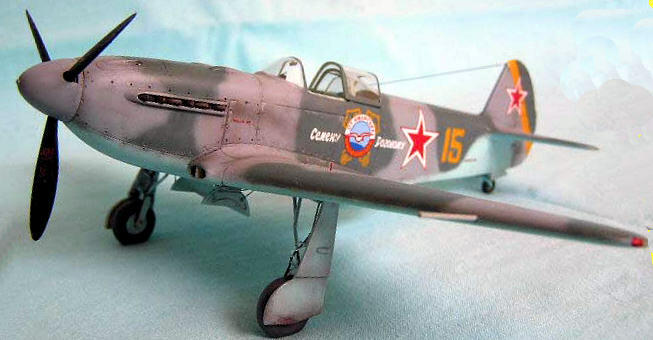 Perhaps the most (perhaps the only) successful light fighter of the war was the Yak-3, an aircraft with a relatively low power engine (barely exceeding 1000 hp, when most Western engines were reaching 2000 hp!) 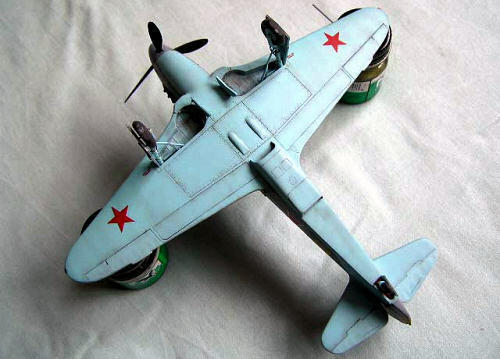 but very light (245 kg lighter than the earlier Yak-1), with a small wing area (reduced from earlier aircrafts in 2.3 sq mts) and a relatively light armament (one 20 mm cannon and two –a short initial series had only one- 12.7 machine guns, though both reputedly more powerful than similar Western weapons) and reduced fuel load. It made a very fast, agile machine (though horizontal maneuverability was reportedly about the same as the much heavier Fw 190) which was supreme as an air superiority fighter. Rogovoy’s machine adds the interest of having served in the brief and sharply fought Russo-Japanese war of 1945. No air clashes are recorded, to my knowledge. I know, box art depicts him shooting down an Fw-190 in this very machine. The Eduard kit has been around for some time now, and it is a clean short-run type injected one. It is very simple (but so is the plane it represents) with no options save for the decals and the PE included in the Profi-pack package. The cockpit is built up on the center wing section. Without the PE parts supplied it would be too bare, but the real thing was very Spartan indeed. Care must be taken when assembling the rear shelf and the glass armor. I left out the cushion for the seat pan, as a quite un-Soviet sundry item! My kit was missing the instrument panel acetate film, so I scrounged some instrument panel decal from the spare box and painfully cut each single dial to match the PE panel. Cockpit floor and sidewalls were painted in ALG-5 metal primer, from the WEMM line. It is a greenish light blue; I think some RLM 65 could do, perhaps with some drops of Sky Type S.
Fuselage and wings got assembled in one go; take care of the alignment of the upper cowling. Mine refused to seat properly, and a thin layer of putty had to be laid to blend the back of it. I perforated the gun troughs and fixed some short pieces of tubing for the gun muzzles. The dividers on the wing root openings were added from plasticard; it was easier than it looked. Upper fuselage to wing joins are superb and without putty they seem panel lines; the lower rear join is hidden by the radiator housing (pretty smart design); only the front join must be carefully blend with the Spitfire-like under nose. The rear lower fuselage, being perfectly flat without any panel line must be also carefully puttied. Horizontal tailplanes are absolutely fool-proof. 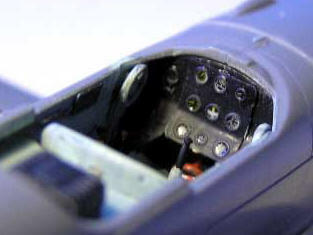 I chose the open canopy: the windscreen fits well, but it needs a small bed of putty to really blend into the fuselage. The rear canopy section is smaller that the fuselage opening at the sides, but not at the rear (which, however, needs some putty-blending); I guess it is intentional, to allow the center section to seat on it. It seems just a little high-riding, though, and I would recommend a vac replacement. I added the rails from stretched sprue. 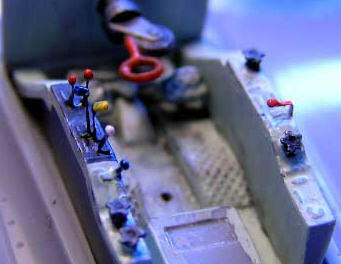 At this stage I hand painted the fuel gauges on the wings’ uppersurfaces. I covered them in Kristal Klear, then in Gloss Varnish, and then masked it with Maskol. They survived the painting and weathering process almost unscathed. Camouflage is in the standard Soviet late war Grays AMT-11 and -12 over AMT-7 Light Blue. I used the Soviet colours from the WEMM range; painting of models of Soviet GPW machines is often defined as “pre-WEMM” or “WEMM” style! These enamels are great, dry with a low sheen and have reportedly very accurate hues. However, having stocked and scrutinized the recommended “pre-WEMM” colours (a motley collection of paints, none of them keyed to Soviet GPW camouflage by their manufacturers! ), the final result is somewhat different and more akin to “earlier conventional knowledge” than to the ground-breaking information once available in the internet page (except, may be, for the AMT-7, a very bright light blue quite unlike any other. RLM 65 –and MM “Russian Undersurface Light Blue”! - seems very greenish in comparison, for example). However, they match quite reasonably the colours in Pilawskii’s book, though printing colours in paper is very tricky. I elected to follow the pattern in the Eduard’s instructions, which do not correspond to the ones in the aforementioned reference. However, a picture showing this very airframe behind some pilots (its owner included) shows the port nose depicted the very characteristic “x-shaped” feature, so I included it in the pattern. Though variances occurred, thinking it over I would recommend discarding the instructions completely and going for one of the patterns in the book, not only in modeling this particular airframe but any of the other options in the box. After a gloss coat, decals were applied. They are rather stiff, especially the yellow motifs, due to the white backing they have to ensure undersurface colors do not bleed. They are also sticky, and moving them around is difficult. I cut the fuselage star from the shield and slogan, but it was not a good idea in the end. Some random silvering couldn’t be prevented from occurring. Very strangely, the well-known Boris Jerjomin plane is only depicted in the standard boxing (there exists a picture showing Mr. Ferepont Golovaty, the donor of the aircraft, in the act of handing it over to Jerjomin; what about private initiative in Soviet Russia?). Basically, it involves fitting the undercarriage and propeller. The later, though a “separate blades” affair, as cherished by Czech model makers as dreaded by modelers, is very simple and sturdy. Not the former, quite fragile and complex. The main legs, though lacking any proper means of being attached, are almost self aligning if left to their own devices. The arms of the pistons on the well roof are too long; the inner braces do not reach the main leg. I cut the arms, and lengthened the braces. Once everything is glued, it forms a quite strong structure. The PE braces for the auxiliary doors are very fragile and tricky to assemble, but so were the originals (meant to close the doors when pushed by the retracting wheels; they were frequently damaged if the pilot did not remember to touch the brakes to stop the wheels spinning within the retracting cycle) Both wheel wells and struts were painted AMT-7; so were the wheel centers, after searching in vain through pictures to find one which allowed it to be painted a contrasting color (Tractor Green?) The resin flattened wheels were used; at first sight they seem exaggerated, but once fitted, they are not. I fitted the exhausts and the “Red soldiers”, as well as the canopy hood (I shall probably replace it with a vac if I manage to get one) and the antennae wire. - “Soviet Air Force Fighter Colours 1941-1945”, Erik Pilawskii, Classic Colours. - “Yakovlev’s Piston-Engined Fighters”, Yefim Gordon and Dmitriy Khazanov, Midland Publishing.